You leave the centre of Gessopalena taking Via Peligna for 1.5 km. At the first fork, cross over the Contrada Atriena, turn right and then left, following directions for Sant’Agata “Place of Nazi Slaughter”. The road, partially tarmaced , goes downhill for 2.4 km. The Majella and the villages on its slopes make a frame for the place where the massacre actually took place, a commemorative plaque in the clearing remembers the slaughtered civilians. You retrace your own steps for 300 metres, at the fork take the path on the right. You proceed south-east for 1.8 km. 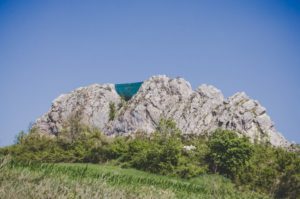 Looking into the sky, on the left, your scene will be dominated by the massive rocky outcrop of “La Morgia”, on which you can admire the upside-down glass pyramid “Orizzonti” (Horizons), a piece by the Greek artist Costas Varotsos. To Reach Torricella Peligna you won’t take the provincial road, but at the hairpin bend, proceed along the white dirt road you are proceeding on, take the path south-eastward, crossing a wooded area. The trail leads on to Strada Il Pozzotello, which after about 500 Mt rejoins Via Peligna, and keeping to the right you go uphill towards the centre of Torricella Peligna (910 metres). Two commemorative plaques in the square remember Commander Ettore Troilo and all the people from Torricella Peligna who lost their lives fighting with the Majella Brigade. Walking down Corso Umberto I southward, you reach the municipal pine forest where you can rest and recover from your fatigue. You go downhill from the pine forest taking Via Risorgimento, and passing a mechanics workshop you take the path on the right, of which the entrance is preceded by a open area with a few benches. The road leads past a farm, and from there you can proceed on the road to the right. The landscape panorama which opens up over the villages on the slopes of the Majella Mountains is wonderful. At the first fork you encounter, you proceed on the left path, towards Fallascoso. You leave the path passing a house, and then you keep on the tarmac road towards the south-west. With Fallascoso behind you back you climb uphill on Via Del Colle and after about 300 metres you will reach the SP132 towards Montenerodomo. From the crossroads, after walking for about 1.5 km, you will find yourself in the vicinity of Iuvanum, which was inhabited in the Bronze Age, the territory of the Carracini, a tribe of the the people of Sanniti, in those days it was a municipality of Rome subsequently it was taken over as a Benedictine monastery, nowadays it is an archaeological site. 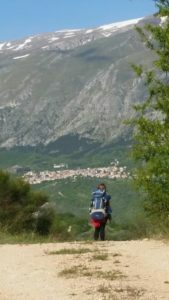 From Iuvanum, continuing on the SP132 for 2.5 km, you reach the centre of Montenerodomo (1165metres above sea level), the first village on the trail inside the Majella National Park. * If you don’t want to reach Sant’Agata “Place of Nazi murder”, you can proceed on Via Peligna, moving around the Rock “La Morgia”, and taking the dirt road on the right for 1.5 km to return to the trail towards Torricella Peligna.